Mysore pak is one of the most popular sweets in India. Besan, ghee (clarified butter) and sugar are used to prepare this delicacy. 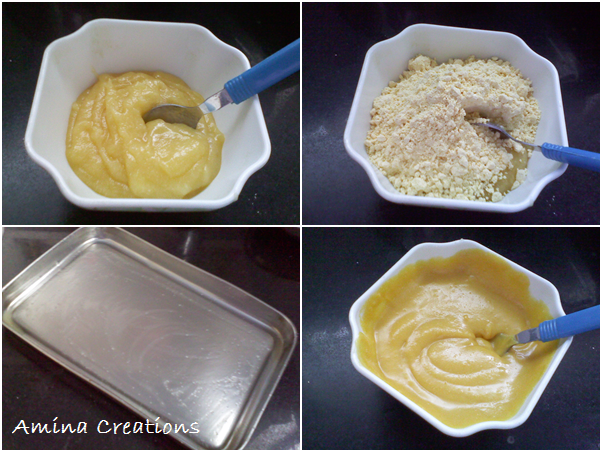 I have already shared the recipe of the melt-in-the-mouth soft ghee mysore pak and in this post will be sharing step by step photos. Take all the ingredients and keep ready. Mix ghee and besan in a bowl to form a smooth paste without any lumps and keep ready. 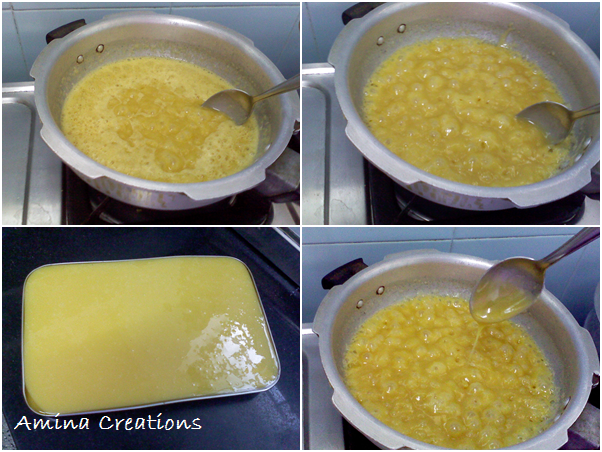 Grease a square or rectangular plate with ghee and keep this ready as well. 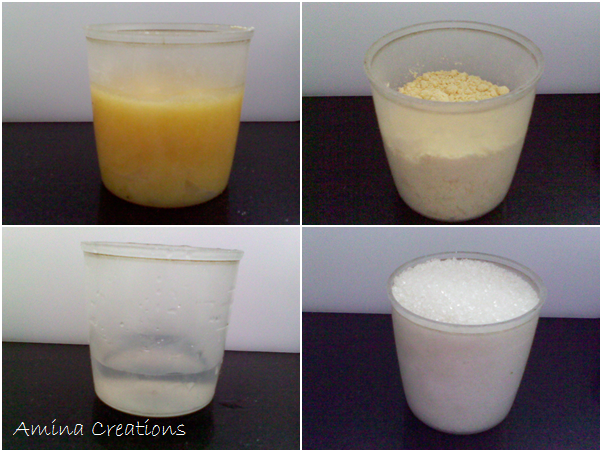 Heat sugar and water in a thick bottomed pan and boil till it forms a single thread consistency (See Tips below). (This might take about 2 to 3 minutes). Now switch off the gas and add the ghee-besan mix to the pan. 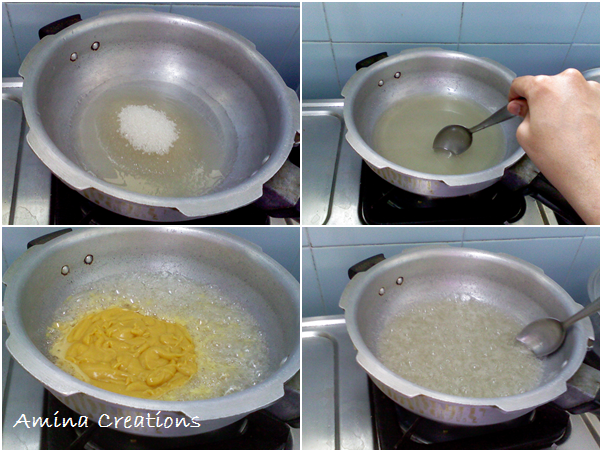 Mix well and switch on the gas and cook in low flame while stirring continuously. Continue cooking for about 3 minutes while stirring continuously. When it starts leaving the sides of the pan but is still in liquid state (and large bubbles are seen), switch off the gas and pour this immediately over the greased plate. Allow it to set for a few minutes. When it has set but still warm, cut it into thin long rectangles. Allow the Mysore pa to cool down completely before taking the pieces off from the plate. 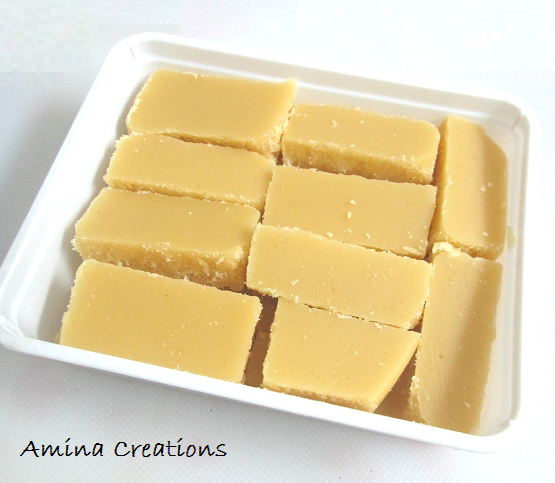 Delicious soft ghee Mysore pak is ready to be served. This recipe makes 12 to 15 pieces. To check for single thread consistency, take a bowl of water and keep dropping small drops of sugar syrup into water every now and then. In the beginning, it will disperse, but when it reaches the single thread consistency, it will not change its shape and remain intact. At this stage, you can add the ghee- besan mix. Increase the proportion of ingredients if you want more pieces. Linking this to Dish it out - Diwali bash event.